Manufacturing, warehousing and distribution businesses across the world are looking for ways to cut costs to remain as competitive as possible. And with productivity more crucial than ever, large warehouse doors are being left open for longer and used more frequently. As internal temperatures drop by as much as 10°C within moments of the doors opening, it’s time for warehouse businesses to stop energy sneaking out of the back door and making a huge hole in their profits. One of the biggest loads on an air conditioner is infiltration, the leakage of outdoor air into a conditioned space. Infiltration is even more costly on cold-storage warehouses, walk-in coolers and blast freezers. Several small openings can have the same effect. Look for poorly fitting doors and windows, gaps around wall penetrations or faulty door closers. The largest concern for insulation is warehouse doors. Doors that are insulated are necessary for any warehouse trying to maintain a strict temperature and defray energy costs. As an open door provides the largest portal for energy loss in any warehouse it is important that your doors are high-speed and easily repaired. By having well insulated, fast moving doors you can save a lot of money from energy escape. Where a door must remain open, consider all your options such as an air curtain. For the all-encompassing solution, without the inconvenience or discomfort caused by constantly opening and closing doors – air curtains fit the bill perfectly. Remax Industrial air curtains cut energy loss by over 80% and deliver a uniform flow of air to separate the interior and exterior atmospheres, maintain the internal climate, offer significant cost savings and deliver vastly improved worker comfort. With the saving made from reduced energy loss, the expense of installing Aircurtains can then be quickly repaid, with the reassurance of on-going economical and environment benefits. 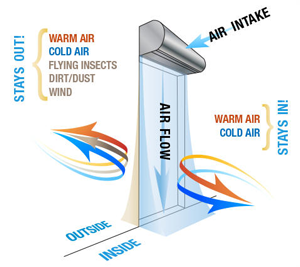 Air curtains will create a barrier of air that keeps the temperature stable even while the door is open. Air curtains can effectively reduce up to 80% of energy loss through a doorway. This means the savings made from the added insulation quickly pays for the initial expense. They are also effective at defending against airborne pests and providing a comfortable and safe working environment is a must for every business owner. With an over door air curtain, energy lost through open doors which was previously seen as unavoidable, can actually be reduced by as much as 80%. As well as their energy saving capacity, air curtains also have ‘hidden’ benefits. As we know, hot air rises and over-door air curtains induce warm air down from high level that would otherwise be lost through the roof, thus helping to de-stratify the building and eliminate cold spots. By providing a welcoming flow of air over your entrances, you can create a greater impression of a clean, controlled environment for your staff and customers. Coldshield Aircurtains work to circulate clean air within your work zone, and the whisper quiet operation ensures minimal noise impact on your environment. Energy efficiency – A large percentage of energy bills is attributed to energy losses through the doorway. Air curtain will lower down energy losses by at least 80% - enough to save you a lot of money on energy bills. Improve work area comfort – Air curtain circulates clean air around the warehouse, work area, or storage facility. Shut airborne nuisances – Without an Air curtain, airborne nuisances like small insects and dust can easily enter work areas. With an air curtain in place, there will be a barrier and entry of airborne nuisances will be significantly reduced. However the opening and closing of external doorways is unpreventable in warehouses and every time this happens warm air escapes and cold air enters. This makes a huge difference to fuel costs. Comparative temperature readings show a drop of between 4°C and 10°C every time a warehouse door is opened. However, with an air curtain the difference is normally just 1°C. (Information source). We cannot disregard the importance of High-speed doors and their role in our facilities. 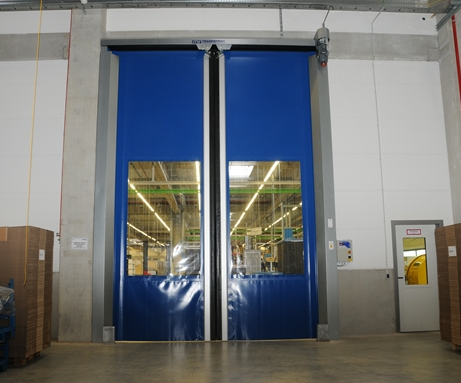 As you know, High Speed Doors are door systems, mainly used in industrial applications. They are technical enhancements of the generally known sectional doors, PVC fabric doors or roller shutters. The main difference is that the durable construction provides a higher operating speed and they are able to sustain a higher number of cycles (opening and closing cycles) and require lower maintenance and repair cost. Depending on the intended field of application, horizontal or vertical operating door types are available. But, not all High Speed Doors are the same. High Speed Doors are defined as high-performance doors, i.e. non-residential, powered doors, characterized by rolling, folding, sliding or swinging action, that are either high-cycle (minimum 100 cycles/day) or high-speed (minimum 20 inches(508 mm)/second), and two out of three of the following: made-to-order for exact size and custom features, designed to be able to withstand equipment impact (break-away if accidentally hit by vehicle) or designed to sustain heavy usage with minimal maintenance. 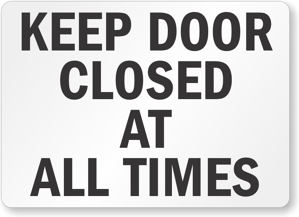 Short opening and closing times reduce cooling loss, avoid airflow and enable a smooth operating procedure as well as create a more effective barrier against outside elements entering the site. Also, some barrier specialists offer a various high speed door styles, from a cost effective, ES40 Rapid Roller Door, to a Movidor High Speed Door and onto a more insulated door such as Movichill Insulated High Speed Door. The Movichill High Speed Insulated door offers a unique solution for high-usage freezer doors, where the 'warm-side' of the freezer doorway is humidity and temperature controlled, with thermal Resistance (R-Value) of 0.6m2K/W. It is worth making sure you know all the options available to you, as well as the manufacturer's warranty and servicing incentives. More importantly, you have the right product for your needs so that you are not left 'out in the cold'. environment and still enable efficient traffic flow? A recently completed DASMA study, presented at Expo 2014 in April, found that if a doorway is used frequently, a high-speed door not only delivers both but can do a better job of saving energy. In our next blog - we discuss 'When a High Speed Door is more Energy Efficient'.